Several years ago, while the legal and public relations battle raged over the future of Vermont Yankee, anti-nuclear activists -- and some elected officials -- confidently predicted that, if the plant closed, its output would be replaced by wind, solar, and other renewable energy sources. Pro-nuclear advocates expressed doubts about that future, arguing instead that the loss of a baseload nuclear plant would inevitably lead to greater reliance on fossil fuels. Similar debates continue with respect to Pilgrim (Plymouth, MA), Indian Point (Buchanan, NY), and other nuclear facilities. Now that 2015 has come to a close, we have an opportunity to evaluate the facts. ISO-New England (the non-profit, independent entity that ensures the reliability of the electric grid in New England) publishes data that shows daily generation by fuel type. That data shows that in 2014 (the last year of Vermont Yankee's operation) natural gas-fired generators supplied 43.1% of the energy in New England, while nuclear provided 34%. 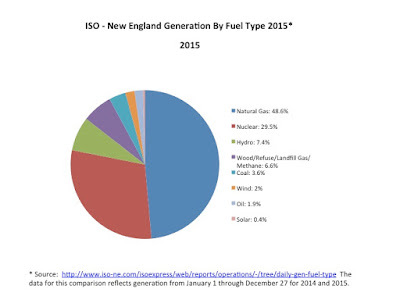 In 2015 (the first year since 1972 without Vermont Yankee) natural gas-fired generators supplied 48.6% of the energy in New England, while nuclear provided 29.5%. 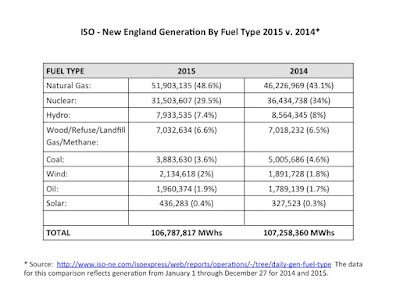 As you can see in the chart below, the contribution of other sources of energy in New England remained essentially unchanged in 2015 compared to 2014 (the largest change was that coal-fired generators contributed one percent less in 2015 compared to 2014 (3.6% v. 4.6%). The contribution of wind and solar remained vanishingly small in both years (wind was 2.4% in 2015 and 1.7% in 2014, while solar was 0.4% in 2015 and 0.3% in 2014). Generators in New England produced approximately the same amount of total MWhs in 2015 and 2014 (106.7 million MWhs in 2015 v. 107.2 million MWhs in 2014). Taking into account the unusually mild weather in late fall of 2015, these figures deflate another prediction by anti-nuclear advocates that Vermont Yankee's baseload contribution could be replaced, in part, with energy efficiency. The bottom line is that, without Vermont Yankee, nuclear's carbon-free contribution to the New England electric grid fell by 5.3 million MWhs in 2015 compared to 2014. Over that same time period, the contribution of natural gas-fired generators increased by nearly 5.7 million MWhs. According to the U.S. Energy Information Agency, natural gas-fired generators produce 1.21 pounds of CO2 per kWh (https://www.eia.gov/tools/faqs/faq.cfm?id=74&t=11). 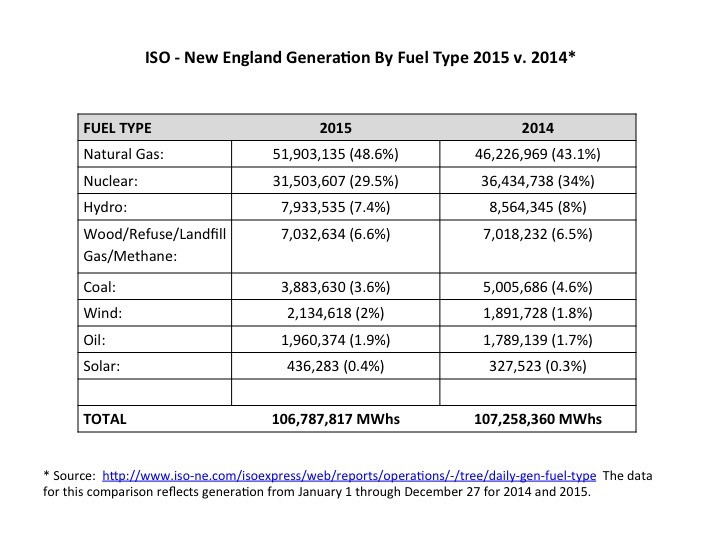 Using that formula, the additional MWhs of energy from natural gas-fired generators in New England in 2015 compared to 2014 equals approximately 3.1. million metric tons of additional CO2 in 2015 compared to 2014. To put that in perspective, 3.1 million metric tons of CO2 is equivalent to adding more than 650,000 passenger vehicles to the roads in New England during 2015. This post first appeared in Linked-In on January 2, 2016 and is reprinted here with permission from Mike Twomey. 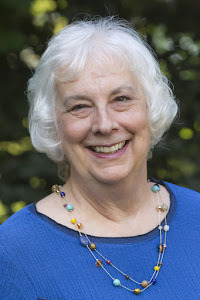 This post is a good companion piece to the recent post at this blog: Vermont Yankee was replaced by natural gas: Doing the numbers. The conclusions of the two posts are the same---because facts are facts. The earlier Doing the Numbers was based on EIA data. 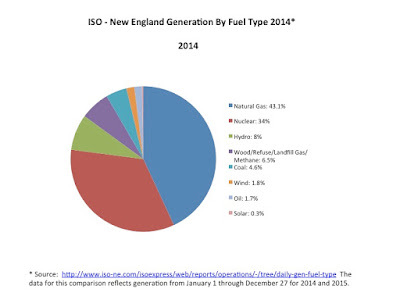 This current post by Mike Twomey is based on ISO-NE (New England grid operator) data. Mike Twomey's post includes data through the end of 2015, while the other post only includes data to the third quarter of 2015. Mike Twomey is Vice President for External Affairs at Entergy. 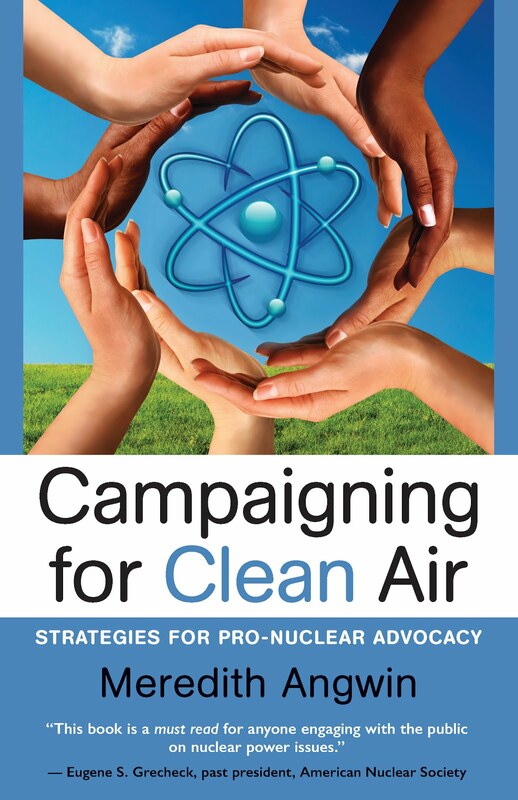 He is involved in many areas of negotiation and outreach concerning the nuclear plants. For example, Twomey was quoted in an October post at Vermont Digger: Entergy may move fuel into dry casks sooner than anticipated. In that article, he explains the financing of dry cask storage at Vermont Yankee. I think the crux punchline as to why there's no real outcry and that the Vermont public would be willing to eat the prospect of higher gas costs is that "anything else is far _safer_ than Vermont Yankee (or any nuke)." Even if wind and solar end up as parasitic subsidized losers that rational would make few lament the loss of a nuclear plant, as I'm sure will continue so in Germany. This is at its core a nuclear PR and de-FUD'ing public education war for the hearts and reason of the public, not a pocketbook one. This article seems to dismiss the growth of wind and solar. While I am pro-nuclear, and think that nuclear needs to play a vital role in our future energy mix, I think the author of the article is neglecting something important - growth of wind and solar. It's true that they are still small. But, if you look at the year-over-year growth rate, as shown by the statistics provided by the ISO and called out by Mr. Twomey, we see that Solar grew 33% in a year, and Wind grew 41%. Of course, one can't predict future growth rates based on one year, but IF wind and solar can keep up strong growth like that, they could conceivably become a very large proportion of the New England energy mix inside of 10 years. It's true that it's likely an overly optimistic and simplistic projection, but just for the sake of argument, if they can keep up that growth rate, then 9 years from now, Wind could produce about 50% of the energy, and solar about 5%. If you projected it to 10 years instead of 9, that would account for more than 100% of current grid generation. However, at the same time, it's very likely that at some point, Wind and Solar's growth must slow. Still, it's a valid point to concede that Wind and Solar, while currently small in absolute terms, are actually growing at a pretty fast rate. I wrote about Vermont's plans to be 90% renewables in today's blog post. Of course, renewable growth from 1 to 3 to 5% is possible and looks great. However, it simply does not scale. Let's oversimplify a little, though not a lot. Most of Vermont is one weather pattern, with some exceptions. Hot, dry and sunny...all over Vermont. Windy at night...all over Vermont. Cold and windless....all over Vermont. Now, obviously, the mountains are different from the river valleys and so forth, but the statement "weather is the same all over Vermont" is far closer to true than its opposite would be. Okay. We cannot turn wind on and off. Let's say that wind has a 30% capacity factor. For wind to grow to 30% of the electricity supply overall, that means when wind is on the grid (the wind is blowing in Vermont)...the grid has to be 100% wind. Without this high percentage when wind is available, wind is not going to be able to be 30% of the electricity, overall. So we have to build a lot of wind to get wind to 30% of the electricity supply, and we have to turn everything else off if the wind is blowing..
Well, what if we build more wind? If we do that, when the wind is blowing....what then? We have to curtail some of the wind, because the grid can't take more than 100% of wind. So, without grid level storage, wind reaches a VERY hard stop at 30%. Well, it is windier in the mountains, and the southern part of the state gets less wind and so forth and this is an oversimplification. And the grid requires more power in the day, and less in the night (when the wind usually blows). So it is quite complicated in reality. But the basics remain. IF you can turn things on and off, you don't reach this sort of hard stop. 100% of the electricity from natural gas...this could work. No "hard stop" involved. 100% from nuclear...well, current nuclear doesn't follow load well, but there is no "hard stop" involved, where you have more nuclear than you can use on the grid. You don't need grid level storage for nuclear, just plants that follow load a little better. And so forth. This is why I am so cynical about the Vermont energy plan. The plan is kind of "We don't just hope for miracles, we expect them."